To understand the purpose of the Volt, we need first to look at what it is and what it’s for, or at least how it could be useful. The Volt’s main purpose is to help keep the camera horizontally and vertically level on a Steadicam, much like you might use a Movi or Ronin to do, if you had no skill. If you do have skills as a Steadicam Operator much of our training and practice is taken up in learning how to do just that – keep the horizon level. That means keeping the Steadicam post perfectly upright despite other factors which disrupt our balance, such as wind, uneven ground, attached cables, or most often simply the pendulum effect of the Steadicam itself as we start, stop or adjust a move. After all, the way a Steadicam works is basically just staying upright due to the bottom being slightly heavier than the top, either side of a multiaxis pivot (the gimbal). This system will therefore pendulum simply because the lower & greater mass has a tiny bit more inertia (and so moves slower), than the camera mass at the top. 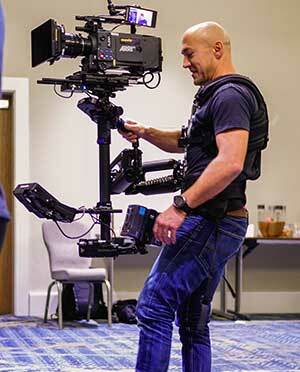 That’s how the Steadicam was designed by the wonderful (and very tall!) Garrett Brown in the seventies, and how the system plus all it’s clones have worked for forty years. As you have no doubt seen, there are other gizmos from other manufacturers available that are designed to help keep your camera horizon level, the Betz Wave for example, and some of the brushless gimbal systems which people have combined with traditional Steadicam setups. All these ideas however, result in certain compromises. These include adding weight to your sled, and having to adjust your operating to make allowances for the way they take some of the intuitive control from you. The Volt is both very different, and a little similar. Similar in the way it uses electronics and motors to help keep the camera level; but quite different to the other systems in that it does not affect your Steadicam sled setup, balancing or operation at all! The Volt doesn’t even add any weight to the sled to have to compensate for because it is mounted on the gimbal itself. It only weighs a couple of pounds, so considering you have an arm with the M1 that can take 70, that’s not much on top, & you really don’t feel it. The genius of the M1 Volt is just that – you really don’t feel it. Because it works on the gimbal itself, it doesn’t affect the way you hold, grip or control the Steadicam. In fact after I’d been using it for a few minutes and couldn’t feel any difference to operating normally, I started to wonder if it was doing anything at all – then I looked at the monitor. The horizon was rock solid level. I ran across the room, no wobble. I did a fast start, fast move, fast stop – nothing. No pendulum, no rocking of the horizon, not even a judder like you get with the brushless gimbal things. Just smooth, precise and magically level horizons whatever I tried! It was like Witchcraft, because operating the sled felt completely normal, yet my horizons even when I entirely let go of the gimbal were so brilliantly level. So how does it work? The Volt needs the Steadicam to be balanced completely neutrally, so no bottom heaviness, no drop time, just neutral balance. Then through it’s motors acting on the gimbal it creates artificial bottom heaviness. The Volt knows which way is vertical, and can easily keep the post upright thanks to the minimal force needed by having neutral balance. So now you can see why the pendulum doesn’t happen, because all the masses are the same, no one mass is pulling any part of the sled unequally. This on it’s own is a revelation. What I didn’t expect was that when you tilt the Steadicam deliberately, the Volt doesn’t try to correct or fight you, it goes with you! Apparently the Volt works to a tolerance of around five degrees, so within that it will correct your horizon, but move beyond that and it will help you keep whatever tilt angle you want. Again, the neutral balance means neither the Volt nor you have to exert much pressure on the gimbal to do lovely smooth tilts, up, down, or even Dutch! What the Volt doesn’t then do is bring the sled back into straight upright, because there’s no bottom heaviness to pull it down. If you need that, then just turn the Volt off & balance as you would do with whatever drop time you need as usual, you don’t event need to detach it from the gimbal. So as an experienced Steadicam Operator with years of practice in keeping your horizons level, and indeed being very proud of your ability to do so even in some pretty difficult situations, do you want a little gizmo to just do all that for you? Won’t that detract from your skill as an Operator? I wrestled with this question until I realized that if you are not fighting the pendulum, or the wind as much, or the many other elements that knacker your horizon those few degrees all the time, then that leaves you with all that concentration spare to use on your framing, sled and foot position, movement, choreography, communication and the myriad of other things we uniquely have to deal with every day on set. We as Steadicam operators sometimes forget that we have a lot more things to cope with and concentrate on simultaneously than any other member of the crew, so surely whatever gizmo that can free up a bit of brain space has got to be a good thing? That’s why we use gyros sometimes, or Antlers, or windkillers isn’t it? Not to cheat or diminish our skill, but to combat the many factors that can make Steadicam Operating harder. The M1 Volt works brilliantly. It does exactly what it is meant to and does it in a way no other add-on to a Steadicam does – without affecting your operating or sled setup at all. Most importantly, the Volt doesn’t give an artificial or mechanical look like you get with the wretched brushless gimbals. The footage looks and feels just like a normal Steadicam shot, but the horizons are always dead on. It’s like you operating on your best day, but ensures performance that every day, and even in poor conditions. The Volt is a wonderfully small and somehow understated device that will allow us to attempt even more complicated and ambitious shots, because with it we have more concentration available. Horizon will no longer be the defining thought process when we are operating, leaving us the brain space to put even more dexterity, creativity and precision into each and every shot. And if we want the ‘old’ Steadicam effect back, just flick the switch to turn it off & drop the post a few inches! The more I think about the Volt and it’s potential, the more I think we are on the verge of a new little era of Steadicam operating, when the shot finally has all the concentration we always wanted to give it, but then the horizon wavered! Tiffen are taking the Volt around for demos, or you can drop in to see Robin & the Steadicam guys at Pinewood, and I really think you should, because the Volt really is something to be excited about. It is only available for the Tiffen Steadicam M1 at the moment, but the plans are to adapt it for other sizes of gimbals in the future. Right now though, if you have an M1 it’s a no-brainer, and I can’t wait to use it in an actual field!